Sometimes it just isn’t the right time. No matter how hard we try to force the stars to align, everything just falls apart. That happens, on occasion, when booking a photo shoot for a magazine. You can simultaneously be on the phone, writing emails and texting all the necessary people to set things up, but it ends up feeling like you’re forcing the star-shape into the square hole on one of those baby toys, and you’re finally forced to admit defeat. It’s not going to happen. 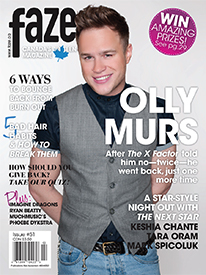 However, when we heard that British pop-star Olly Murs was going to be in town, we desperately wanted it to work so we could have him on the cover. Talented, charming and cute—what’s not to love? So, I made my calls, pounded the keyboard and stayed locked to my BlackBerry. And, much to our delight, we confirmed a date, time, location and team with record speed. The stars had indeed aligned, and we soon found ourselves face to face with one of the U.K.’s biggest rising stars, whose single “Troublemaker” (featuring Flo Rida) has quickly become a hot tune for summer. While North America is still in the discovery stage of this gifted artist (although you may remember his previous single “Heart Skips a Beat” from 2012), British fans have been plastering their bedroom walls—as well as the Twitter-verse—with all things Olly, for three albums worth of time. But his latest album, Right Place Right Time, has now launched in Canada and the U.S., and Olly is in the spotlight, on a broader stage, hoping it’s the “right time” to conquer this next step. It was that adventure along the Australian coast that forced him to come to terms with the fact that music was still very much a part of him, and he just couldn’t give up trying to make it. A friend he met while travelling tried to persuade him to stay in Australia longer, rather than heading back to the U.K., as planned. But Olly told him he wanted to go home. He had to try out for The X Factor again. “He literally laughed in my face,” he says. He went on to qualify as one of the top two in the sixth season, ultimately accepting runner-up to winner Joe McElderry. 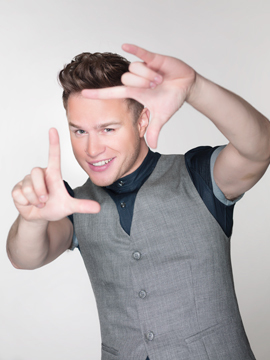 By then, Olly had a list of industry contacts a mile long, with rumours already circulating that he would record an album, following the finale of the show. Sure enough, Olly signed a record deal and returned to The X Factor franchise to co-host its companion show, The Xtra Factor. His first and second albums, Olly Murs and In Case You Didn’t Know, both went platinum in the U.K., and he snagged a coveted spot touring with fellow Brits One Direction on their American tour. Now, that “right” feeling has led him to dive into the North American music scene, touring and promoting his third album—but first one here—Right Place Right Time. And it certainly does feel right. From his old-school style and captivating vocals, to that killer smile, Olly Murs should have no trouble crossing over to increase his fandom. Sometimes it just isn’t the right time. And sometimes it is. That relationship, that job, that golden school-acceptance letter—you can just feel that it’s going to work out. And in those instances, it’s important to trust your gut. “I was in the right place at the right time when I auditioned for The X Factor. It felt right. And everything that’s happened since then,” Olly says. FZ: Tell us about a charity that you support, one that’s really close to you? OM: There’s a charity called Brainwave. They’re based in the U.K. I really wanted to support a young charity, a smaller charity, and Brainwave was around the corner for me. They support kids [who have] cerebral palsy and are born with brain problems, basically. dence that their child can have a normal life. lm and animation. This charity is small, but it’s amazing to be a part of it. I’ve raised quite a bit for them in the last few years. We’re going to do more of it in the future—some big events. FM: Why is it important for you, as an artist, to give back? OM: I think it’s important because not many people can be in my position, where I can make people aware—people from across the world. But, also, a lot of these kids listen to music and know who I am, and that can always be a great boost. Even going to other charities, I’ve been to hospitals where there are treatment wards and there are kids in there. It’s such a sad feeling, walking in and seeing that these kids have been through so much. But when you go in there and see their smiling little faces, and that they’re enjoying their day and the fact that they’ve met you, it puts things in perspective. 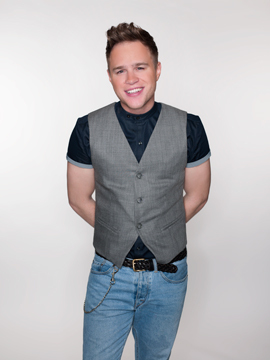 In the first outfit, and on the cover of Faze Magazine, Olly is wearing a Nordem Hirst shirt, a Christopher Bates vest and Olly’s own jeans, belt, shoes and chain. In the second outfit, Olly is wearing Christopher Bates pants with suspenders, a Vince top from The Bay and John Fluevog shoes.